LEH LED Rope Lights RGBW Light Strip Waterproof 5050 SMD 16.4 Feet 300 Leds LED Strip Lights Full Kit. 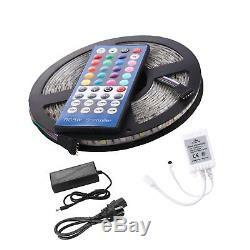 12V Led Strip Low voltage, Waterproof , Cuttable, Comes with adhesive, Convenient and safe to use. Remote Controller Dimmable and flash speed controllable. You will get more than 16 different colors and 8 flashing mode with the IR remote(battery included). You could also turn off the white color separately to make a romantic atmosphere easily. 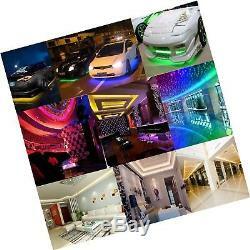 2 in 1 Design 150pcs RGB(color changing) LEDs and 150pcs Pure White(for lighting)LEDs. Work with RGBW controller (included) can achieve multi-color gradual changing, jump changing, quick flash, slow flash and ect. Of course the controller has Dimmable function and Memory function. Our Guarantee Product quality certification(CE, ROHS, FCC, UL), worth your trust. 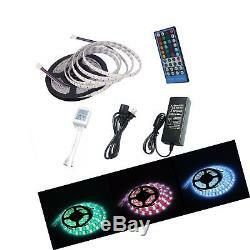 Package included1 5m 300leds Tape Lights, 1 40 Keys Remote Controller, 1 12V 5A Power Supply , 1 Product Manual. 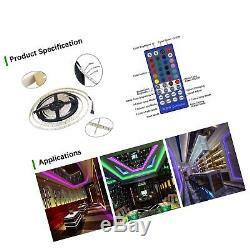 Color Name:5050-RGBW-16.4ft Applications Indoor lighting, advertising and decoration, signage, catering, discotheques and bar, dressers, kitchens, Christmas, windows and thousands of other uses for your smart home. Ideal for generating a cozy and romantic environment. The way you customize your lighting is only limited by your imagination! You could use it for anything! WHITE color could be used for reading or lighting. 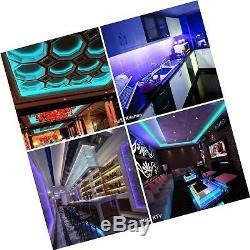 Designed with 150pcs RGB LEDs and 150pcs pure WHITE LEDs. Go work with RGBW controller can achieve multi-color gradual changing, jump changing, quick flash or slow flash effect. 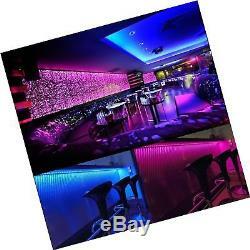 You can alos turn off the white channel, and then you get a normal RGB strip light and easy to get a romantic atmosphere. It can remember your last color mode you select. You can dim the lighting brightness to meet your usage request. Multi-color and multi-mode can be selected. Before InstallationIn case of overheat, please unwrapped the LED strip before powered! Make sure the surface smooth, clean and dry before applicating the 3M Self-Adhesive Tape. 3M Self-Adhesive Tape is suitable for smooth surface, such as glass, smooth ceramic, etc. Do not stick to rough wood surface, lime wall, etc! Pls noted:This is a standard 16.4ft kit, pls don't connect more than 16.4ft, or it will damaged the power supply and controller. You may return items in its original condition within 30 days. 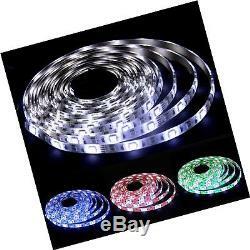 The item "LEH LED Rope Lights RGBW Light Strip Waterproof 5050 SMD 16.4 Feet 300 Leds" is in sale since Saturday, September 9, 2017. 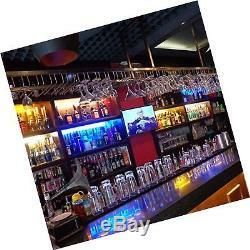 This item is in the category "Home & Garden\Lamps, Lighting & Ceiling Fans\String Lights, Fairy Lights". 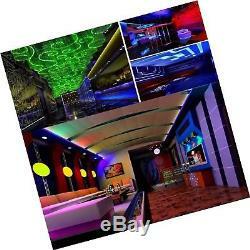 The seller is "mightygalaxy" and is located in Las Vegas, Nevada. This item can be shipped to United States.